The physical, tactile presentation of your images in a wedding album or book cannot be replaced, especially in this ephemeral digital era. More images are taken today than at any moment since the invention of photography. Most stay as a series of digital dots and dashes, never to be seen again, probably to end up being lost. Print images, that’s how to save them, to treasure them. Put them on the wall or in a book. Save the images for future generations to see. 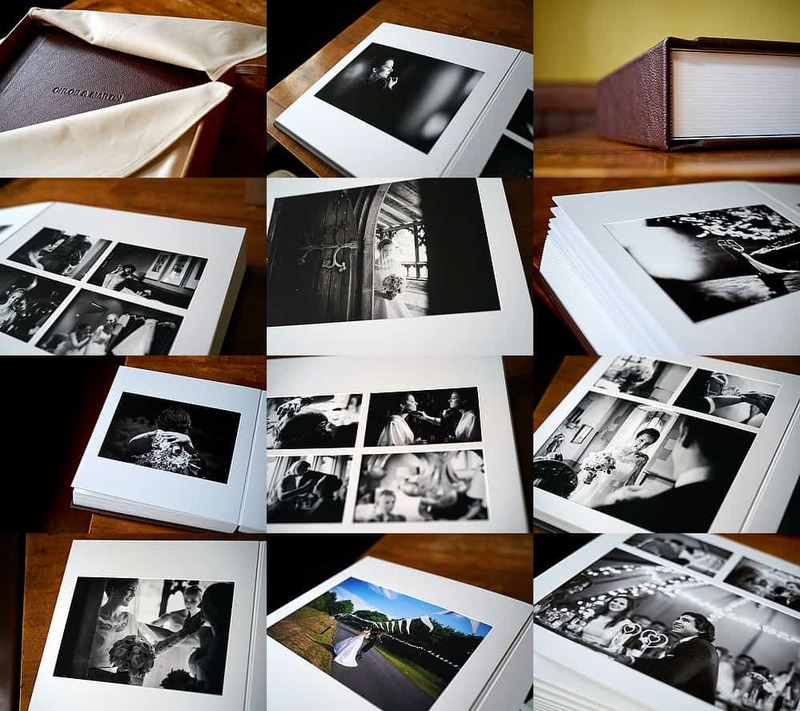 It’s all too easy to get a usb stick of images, admire them for a while, maybe print out a couple, pop some on your ipad but put off creating a real, physical book. Life has a habit of moving on. You meant to do it but now “where are those files?” These albums are contemporary – no ivory covers, no tissue paper interleaves. Simple, classic layout designs intended to let the photographs speak for themselves – without wacky angles, merging frames, background images or spot colour. More timeless. Made in Britain ( in Yorkshire ) to an extremely high standard of craftsmanship. These albums have proved very popular and once you handle one, you can see why. Fine art printing, archival quality paper…beautifully sharp images (without looking ‘digital’)…archival quality inks…a choice of cotton or vintage leather covers. The album comes wrapped in a sleeve made from natural, unbleached cotton and housed in a sleek keepsake box that’s made from recycled material. One of the key features, apart from the quality printing and construction is that they open out flat with an almost invisible crease. This allows panoramic or letterbox shaped images to be placed across two pages, should this fit the layout design. Collection or delivery can be quoted for. 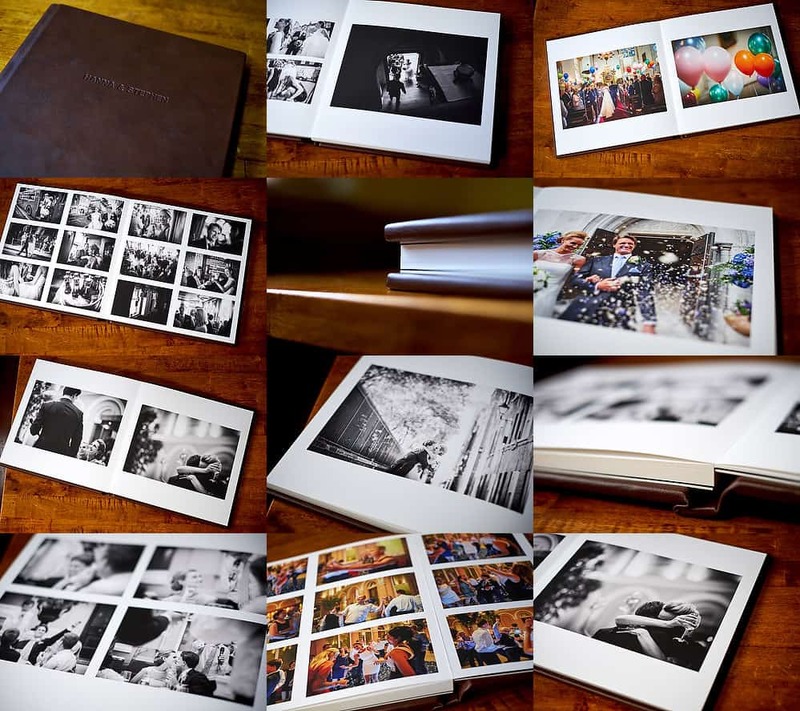 Another popular wedding album that oozes quality and deserves the ‘heirloom’ tag. Made by the same company in Yorkshire. It shares the same high craftmanship, as well as many of the features of the fine art album, such as the vintage leather covers, but it uses matts. A more traditional presentation, in a sense, being a matted album rather than a book format. Images are presented behind white matts, rather than images printed directly onto the page, as with the other albums above. It makes the album thicker and more substantial. Again, presented in a sturdy box and cushioned in a cotton bag – the construction is lovely, as is the crisp printing. Definitely a luxury album with a solid, smart appearance.